Who Was Suzette and How Did She Inspire Delicious, Flaming Crêpes? We all know crêpes Suzette, the dramatic dish of crêpes flambéed with brandy and Grand Marnier. But do you know the story of Suzette, the dish's namesake? In this series, we reveal the secrets, histories and quirky bits of trivia behind your favorite foods. We all know crêpes Suzette (even if just from clichés on TV or in movies)—the dramatic dish of crêpes flambéed with brandy and Grand Marnier. But do you know the story of Suzette, the dish's namesake? There are two prevailing origin stories about the dessert, and they trace the dish back to two very different women. According to one theory, French actress Suzanne Reichenberg inspired the name. During a production at the Comédie-Française in 1897, Suzanne (better known by her stage name, Suzette) played a maid who, in one scene, served crêpes. The real-life chef who created the crêpes for the play decided to flambé them for added drama, and the image stuck: The dessert was associated with the actress from then on. 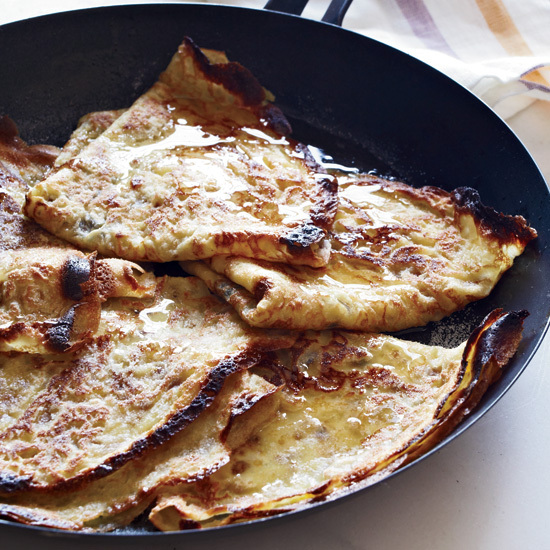 Another legend traces crêpes Suzette to a ritzy Parisian dinner party in 1895. The guest of honor was the Prince of Wales (the future King of England), and 14-year-old assistant waiter Henri Charpentier was tasked with the preparation of his dessert. According to Charpentier's autobiography, he was making the dessert, which included some alcohol, near a chafing dish and it accidentally caught fire. Initially, Charpentier thought his life was over, but then he tasted his creation. It was delicious. The Prince agreed, but protested having the dish named after him, as there was a lady present. The lady in question was Suzette, the young daughter of another guest at the party. Actress or adolescent dinner party guest—we may never know who the real Suzette was. But we can thank her for inspiring such a delicious dessert by eating every last bite of the crêpes she inspired.